The New York state budget passed first thing Monday includes a proposal to close two or three prison facilities. The idea is not sitting well in the North Country, which has seen facilities shuttered in the past. The New York Division of the Budget estimates the closure of two or three prisons could save the state nearly $35 million dollars. Gov. Andrew Cuomo, appearing on WAMC Monday, said the inmate population is dropping and 1,200 beds are no longer needed. Some central New York Republicans are split on the results of this year’s state budget, which passed the legislature Monday. Onondaga County Executive Ryan McMahon said he appreciates that Aid and Incentives for Municipalities or AIM funding was restored for towns and villages, after Gov. Andrew Cuomo proposed cuts. But McMahon said he is disappointed the funds come out of the county's share of Internet sales tax revenue. They sent out a statement early Sunday morning saying that the $175 billion budget holds spending growth at two percent. -a permanent 2% property tax cap. -an additional $1 billion for school aid for aid that will total $27.9 billion. -criminal justice reforms, including reforming the cash bail system. Gov. Andrew Cuomo continued to defend his choice to hold a $25,000-a-plate fundraiser attended by key lobbyists two weeks before the budget is due, saying he supports public campaign financing. In a radio interview with WCNY’s “The Capitol Pressroom,” Cuomo said he was not influenced by the money he received from donors. “If anyone suggests that any position I take is linked to a contributor,” they would be wrong, Cuomo said. The sponsors of a bill to ban single-use plastic bags in New York are optimistic that the measures will be part of the new state budget. But there are still details to be worked out, including whether there should be a fee on paper bags. Lawmakers and environmental groups stood outside the Assembly chambers in a Capitol filled with groups making their last-minute pitches for items in the state budget. Assemblyman Sean Ryan of Buffalo held up a crumpled plastic bag and said the overuse of the bags is an environmental scourge. Unions and many Democrats in the state Legislature are pushing for an expansion of the state’s prevailing wage law. But they are finding that the change might have some unintended consequences. Supporters of legalizing recreational marijuana plan to hold rallies each day at the State Capitol this week, urging Gov. Andrew Cuomo and state lawmakers to include the measure in the state budget. Kassandra Frederique with the Drug Policy Alliance said supporters worry that if the issue lingers until later in the session, its chances of passage will diminish. With less than a week to go to the budget deadline, interest groups converged on the state Capitol, lobbying to get their measures included in the budget plan, and in some cases, to keep items out. The new state budget, due April 1, will be first one decided by an all-Democratic state legislature in a decade, after Republicans ruled the Senate for most of the past century. And while the leadership of the Senate and Assembly have been newly reasserting their governing powers, when it comes to the spending plan, there’s only so far that they can go in their disagreements with Gov. Andrew Cuomo. Gambling casino companies are pressing Gov. Andrew Cuomo and the legislature to allow them to open gaming centers in New York City as part of the new state budget. There are a number of obstacles to overcome, but the proposal may seem tempting to lawmakers, who are strapped for cash this year. Lt. Gov. Kathy Hochul has criss-crossed the state over the last several weeks sounding the alarm that the state's two percent tax cap, which limits local government and school district spending, is more important now than ever and should be made permanent by the state legislature. "This year because of the uncertainty out of Washington, and knowing that our taxpayers are taking it on the chin because of the loss of the state and local tax deduction (SALT), we think we need to come out even stronger and enshrine this two-percent tax cap and make it permanent," said Hochul. With just a little over two weeks to go before the state budget is due, Gov. Andrew Cuomo’s top budget officials say they have to revise their spending proposal, now that President Donald Trump has released a budget plan that they say could devastate New York’s health care system. They’re pressuring the Legislature to rein in their spending proposals as well. With three weeks to go until the April 1 budget deadline, Gov. Andrew Cuomo is drawing some lines in the sand on items that he said must be in the spending plan, like a permanent property tax cap. The state Senate and Assembly are due to release their own versions of the state budget this week. They come as Gov. Andrew Cuomo is demanding that a number of unrelated provisions be included in the spending plan. Without them, he threatens, the budget could be late. The governor’s budget director, Robert Mujica, listed in a statement the items that he said must be in the budget in order for Cuomo to agree to it. They include a congestion pricing plan in Manhattan to help pay to fix the subway system, and making the temporary property tax cap permanent. The state comptroller has come out with revenue projections that will limit the ability to spend more money in the state budget. Under law, the governor and Legislature have to abide by those numbers — but that hasn’t stopped interest groups and some lawmakers from saying that they will increase spending. Gov. Andrew Cuomo and his Democratic colleagues in the legislature are at odds over agreement on the amount of revenues New York has to spend on health care, education, and other items in the state budget, which is due in less than a month. The State Comptroller may have to step in and decide if there’s no agreement by the end of the day Tuesday. As advocacy groups continue to pressure Albany on various causes ahead of this year's state budget, a statewide educational equity tour made a stop in Syracuse, last week. A collection of local officials and other advocates said New York’s schools are underfunded by $4 billion. 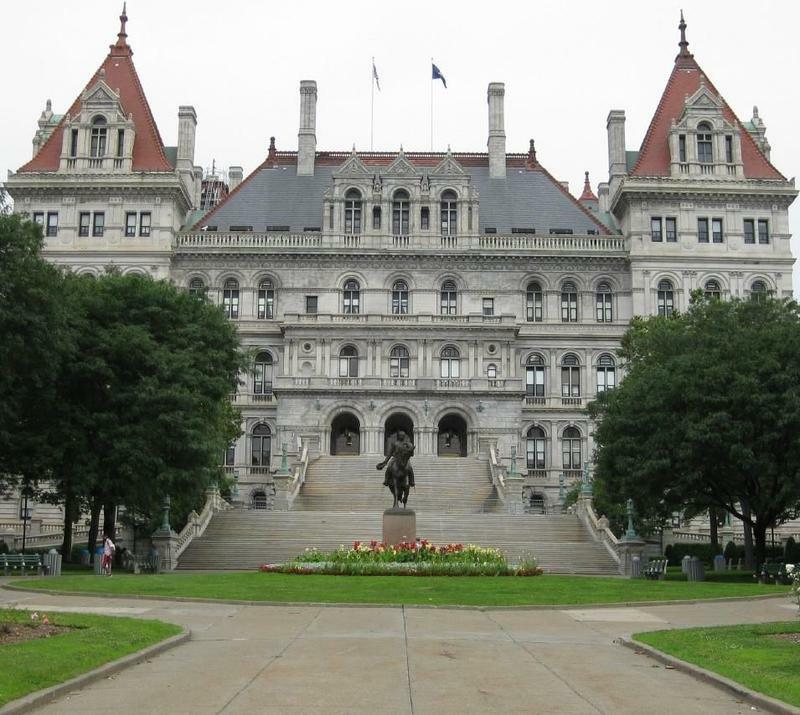 Economists and financial forecasters, speaking at the state Capitol Thursday as part of an annual consensus forecast meeting on the state budget, are warning of an impending recession in New York and the nation. The state is already experiencing some warning signs, with the governor’s budget office predicting a $2.6 billion deficit. It’s a busy time at the state Capitol, with just over one month to go until the state budget is due. Groups are bringing advocates by the hundreds to try to get their favored items placed into the spending plan. Meanwhile, there are lingering recriminations over the failed Amazon deal. Among the groups vying for attention at a crowded state Capitol, are advocates for public campaign financing. Are the rich fleeing New York over SALT? Gov. Andrew Cuomo says changes to the federal tax code led to a growing state deficit and is causing some high-income earners to leave the state. But progressive groups, some Democratic state legislators and even some millionaires are pushing back against that assertion, saying there’s no hard evidence that any wealthy New Yorkers are leaving.